Register Log In Home Forums ADC Forum Groundhogs difficultly? I have some groundhogs giving me fits. Looking for suggestions. Den entrance on left and right sides of air conditioner going down along the house foundation. Privacy fence left and right. Very nice community so limited to cage traps and body grips in covers. 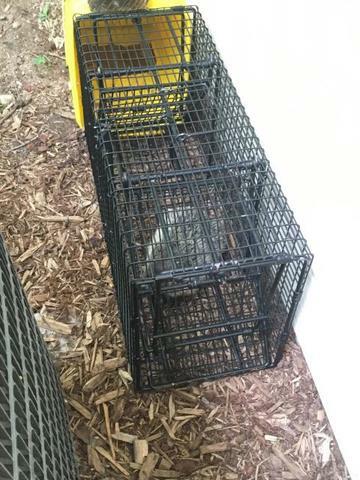 First day caught one in a cage trap. Since then they avoid cages and move only slightly. Pulled out for 3 days to let cool off and reset. No better. Thinking of choking down den entrances and putting body grips in enclosures and fencing tight. Maybe put out bait with no trap and let them feel than set trap back away from the hole and give them a little space. I have a very small business so I can take the time. Usually in my area this time of year, there is only one ground hog in a den. We posi set with double door cage traps. Just what works for us. Every day is a gift from GOD, don't waste it!! bodygrips with chicken wire over the top with 3 inches of clearance underneath works real well..160's.. I have filled in holes and they were reopened. What brand and source for two door traps? Will try chumming them without cages for a few days. 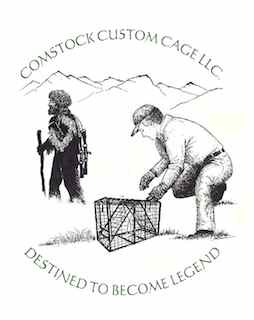 We use Comstock double door cage traps. Snares and body grip trips in the front of holes are not legal in my state or several others. Tony - can you tell me the cable and loop sizes? Thanks. Jim - I will check out the Comstock traps. I have read about them, but never seen them. Where can they be ordered? Both cable restraints and snares are legal for ADC work here - with limitations. I don’t use cable restraints or snares in civilized areas. Too much of a chance for problems. Body grip traps are also legal with limitations. We can set 5x5 in front of a den entrance. Anything larger With a maximum of 7x7 must have an enclosure to prevent anything getting caught from the outside. I like that restriction and agree with it. Even though there is a leash law everywhere for dogs, and similar rules for cats, I don’t want to catch somebody’s nice pet - and I don’t want the PR nightmare. During fur season while coyote trapping a couple years ago I caught something that caused a difficult problem. Not for me, but for everyone else involved and so the landowner got annoyed at me. He understood that I did everything by the book. He learned that some bad guys were using part of his land for illegal activities. I order directly from Jim and Judy Comstock- https://comstockcustomcage.com/store/. LA - thanks for the info! Have you guys tried the Comstock wire triggered multi purpose with 3 nose cone approaches? I believe with 2 of those traps, this job will be finished quickly. If I don’t have them tomorrow in my 220 in a nose cone system that has worked well in some applications, I will be ordering 2 tomorrow. Of course I also have to catch the stragglers living away from the house. I have those dens set. easy peasy comstock set. nosecone, bucket, what have you. positive set over entrance, zero miss if den is active as you say. Thanks for the info and photos. This is a very one location specific application which I do not recommend. It is an interesting one-shot solution. Based upon photos, I knew the critter was in the den. Yeah, yeah, yeah, maybe it wasn’t. How could I know for sure? I agree, but two very good cameras gave me current intelligence. Since I do not have any flush door cages, I made a couple “nose cone” boxes using solid 3/4” thick lumber. It is sort of the reverse of a cubby box. Slotted the sides for 220 springs. Stapled hardware cloth on the open end so looking out from the den it appeared to extend the den entrance. This design prevents anything from tampering or getting caught externally. I drilled a 3/4” hole in top and bottom at edge for a rebar stake. I shaped the den entrance to fit the box, slipped in a 220, slid it up tight, and put a stake through to anchor. Then I pushed dirt against the box to seal out light. This strictly follows our requirements for 220 use. Never set a 220 without checking the relevant regulations. This was set at a summer vacation home that is occupied 2 days per week by elderly folks. They do not have any kids visit. No kids live nearby. No pet issues either. I was tired of screwing around and wanted results. 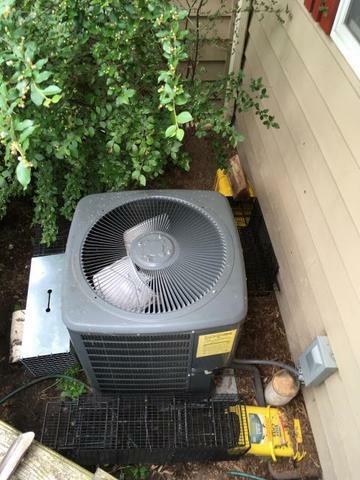 Although the customer was patient, he was concerned about results as he should be. Yesterday I put one of these at each side entrance. Today a groundhog that attempted to exit the den was in a 220. Is this the best method? No way! Did it work? Yes. Was it efficient? Not at all. Would I recommend this? No. I recommend ordering nose cones, flush end traps, and making it look easy. I called Jim Comstock to order a few setups. well, you got it done, that's (almost) all that matters! Fortunately the customer at the house. 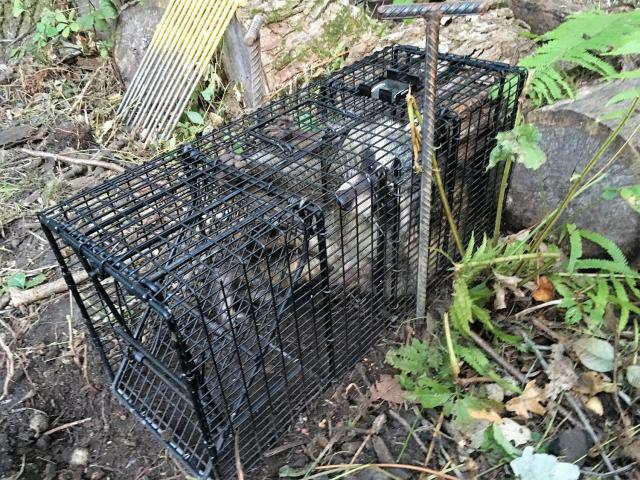 He is a really friendly guy and as you know the trapping can be the highlight of their day. So the customer went along as I checked the traps. He was delighted that I caught the groundhog and to him i guess I didn’t make the process look to bad. I was relieved for catching the groundhog and for killing a giant spider that must have escaped from a 1950s horror film. After I reviewed the website, I spoke with Jim Comstock. He was very helpful. There are so many options that it is confusing what to order because I would like to get the most versatility. The shorter traps look better for awkward spots. The flush mount door looks great, but takes up part of the catch length, so probably upsize to compensate. The sheet metal nose cone looks very useful. It would be great to get double duty for groundhogs and raccoons, but these traps will be primarily for groundhogs so I don’t want to compromise by not getting the best tools for the job. I don’t want to buy something that works only marginally well for both animals. Bob - what length traps are in the photos? At first I will probably be ordering two traps to try out. Of course I need more. I would like your suggestions for which traps and nose cones to buy. Maybe two different styles? The shipping on these is outrageous! Thank you for your suggestions! Willy, these are 24" double door and 30" flush mount. 9" x 11". 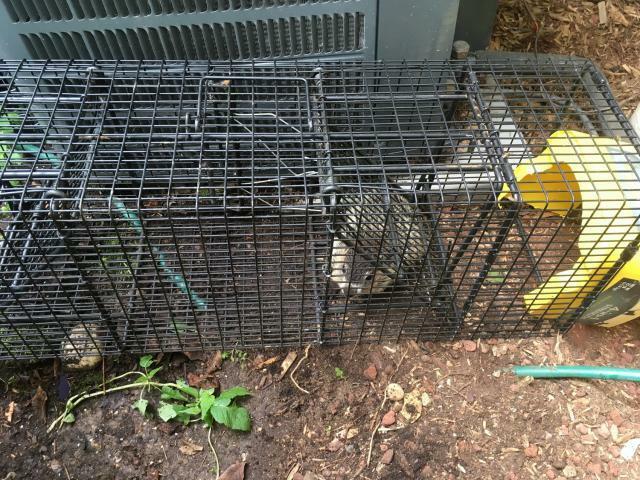 I have caught raccoon in the 30" trap, even in the 24" as you can see, but they do destroy the trigger. Triggers can be bent back into shape, or replaced. 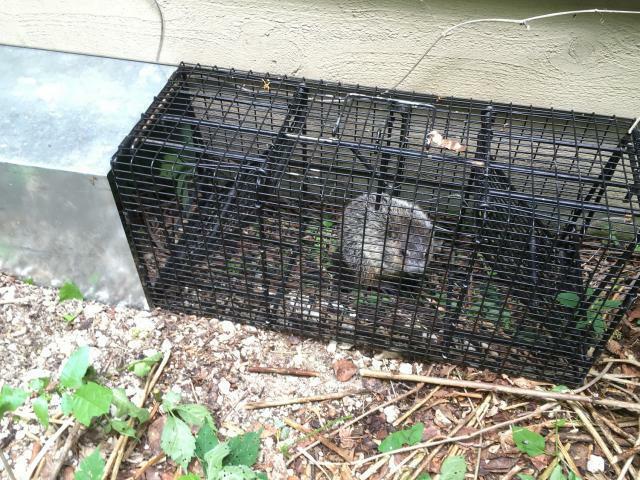 By now I have added some 18" traps, they work very well for groundhogs and are a bit lighter to carry. Best to pick these traps up at conventions and save the shipping. Many suppliers will be happy to bring your order to a convention at no additional charge, or you just go there and see what they have. Have heard from a lot of trappers that this has been a banner year for chucks all over the country, easy money with baitless trapping, double door traps with nose cones. I think I am more than double the usual catches with calls still coming. I never remember chucks in town like they are now. Call me if you are still having problems. By the way a cr in this case could be your answer.